I’m pleased so say I really like them and dare you to try them too. For the Warhol TQ No 1. It’s really simple. Stamp is from Paper Bag Studio. For the Warhol TQ 2. 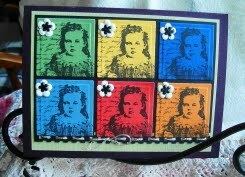 Once I started stamping this face from Hampton Arts, I became hooked on it. Our instructions say to repeat the image three times, “Well if three is good”, “Six is better”? And why not dry emboss the background. I also used pop dots to raise the faces. Kinda cool looking. 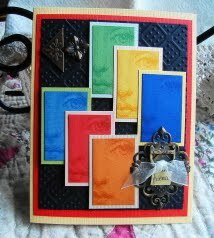 I hope you have time to try these two TQ’s, as they really work up fast and it’s a great way to use up all those scraps of paper. All the techniques are super work.